With the US Shale Oil industry up in arms, Venezuela screaming, and Russia awkwardly quiet (as the Ruble slides with the falling oil price stabilizing domestic inflows), the 'secret' Saudi-US oil deal that pressured prices for crude down to $80 (18-month lows today) has 'hurt' a lot of the world's producer nations. However, as Bloomberg reports, there is one nation that is very grateful. 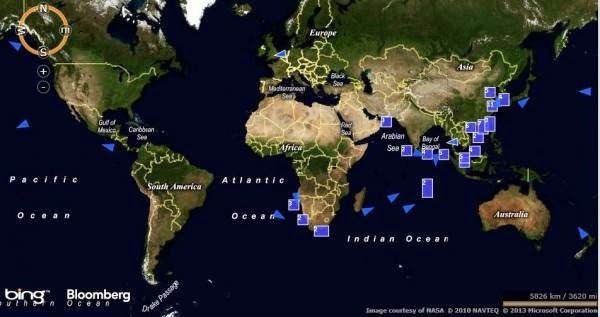 The number of supertankers sailing toward China’s ports surged to a nine-month high as over 80 very large crude carriers (VLCCs) - the industry’s biggest ships - sail toward the Asian country’s ports. At an average of 2 million barrels each, the 160 million barrels will help refill China's 727 million barrel SPR which it started in 2012. The number of supertankers sailing toward China’s ports surged to a nine-month high amid speculation an oil-price slump is encouraging the world’s second-biggest crude importer to accelerate purchases. There are 80 very large crude carriers, the industry’s biggest ships, sailing toward the Asian country’s ports, according to IHS Fairplay vessel-tracking signals compiled by Bloomberg at about 10 a.m. today. That’s the highest since Jan. 3. Average shipments are 2 million barrels. Brent crude, the global benchmark, plunged to a four-year low yesterday amid speculation Saudi Arabia, Kuwait and other nations in the Organization of Petroleum Exporting Countries won’t curb production. The slump is likely encouraging buying to fill China’s strategic stocks, according to Energy Aspects Ltd., a London-based consultant. The 80 bound for China compare with an average of 63 for the past two years and match a record in data that started in October 2011. In summary, just like Chinese gold imports rise when the price of gold drops; so China does the logical thing with other commodities, (i.e. oil) when prices tumble and instead of selling into the paper rout, it buys all the physical it can get its hands on.